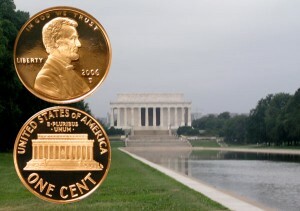 Today, the Lincoln Cent Coin with its memorial reverse tells the story of the ideas put forth for the Lincoln Memorial. First, on February 9, 1911, Public Law 346 in the sixty-first Congress passed: An Act to provide a commission to secure plans and designs for a monument or memorial to the memory of Abraham Lincoln. The Debate in Congress over the Proposed Lincoln Monument Brings to Light Friends and Enemies of Memorial Road Plan. Mr. McCall: “A half century nearly after his death and the close of the Civil War there is nothing in the city of Washington to remind one that Abraham Lincoln ever existed except perhaps that scarecrow in front of the District court building and the statue of which all must speak in terms of veneration and respect which was raised by the contribution of ex-slaves. We have a great monument here to Washington and are soon to have a splendid memorial to Grant, and the object of this bill is to provide that there shall be erected here in this city a memorial to Abraham Lincoln. We were unable two years ago to procure the passage of suitable legislation because of the advocacy of so many different plans. There was a plan for a bridge, there was a plan for some sort of structure in the new parkway, there was also a plan for a way to Gettysburg. All of these plans had more or less merit in them, but on account of the advocacy of all of them none was adopted. Imagine, a road, the Lincoln Way, instead of the larger-than-life Lincoln Memorial. Somehow, a road just would not honor the man’s stature nor garner the same respect and remembrance as the memorial. Of course, a Lincoln Highway does from San Francisco to New York —in operation since 1913. 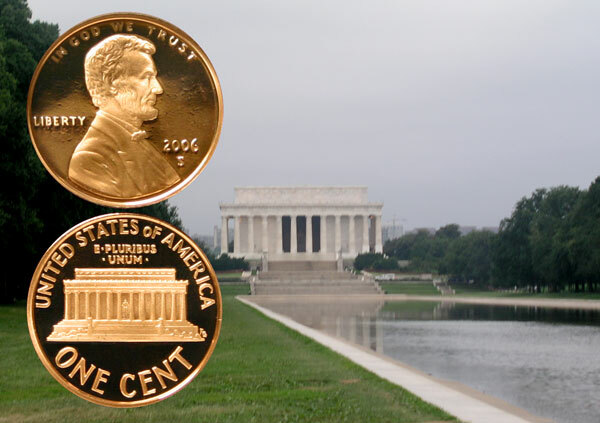 The Lincoln Cent Coin shows against a background of the Lincoln Memorial with the reflecting pool.